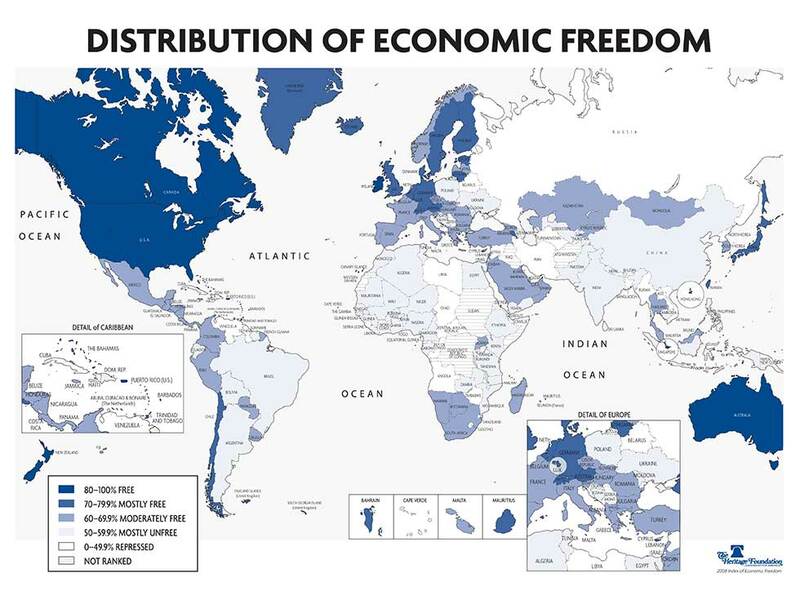 The 2008 Index provides an even clearer picture of economic freedom by using data-driven equations which allows countries to be graded between scores of 0 and 100. We continue the tradition of equally blending "Ten Freedoms" to produce a simple, unbiased overall score for each country. Review the briefing: What's New? This essay argues that whether the economic infrastructure is "successful" or "perverse" and whether the "reward structure" is conducive to innovation and entrepreneurship rests on the degree of economic fluidity. Without constant mixing across boundaries, without the creation and testing of ideas, and without learning and adaptation, the specific character of the institutional structure matters little. Fluidity determines whether or not the structure will be successful in facilitating growth. Will today's poor countries catch up with the industrial leaders, or will they forever lag behind? The answer is that all countries have the potential to become rich. Rapid catch-up is possible; we have seen a number of countries do it in the past 50 years. Narrowing the economic gap requires certain economic reforms—reforms that are likely to be opposed vigorously by certain societal groups who rightly or wrongly believe these reforms will be to their detriment. Weakening and countering this opposition will be key to narrowing the gap. What we call "globalization," one of the most powerful and positive forces ever to have arisen in the history of mankind, is redefining civilization as we know it. Globalization has six major characteristics: economic development, democracy, cultural enrichment, political and cultural norms, information, and internationalization of the rule of law. The 2008 Index also has our traditional country pages, so that each freedom in every economy is explained in detail. Every country page includes new charts highlighting the strengths and weaknesses of each economy.